Amazing! 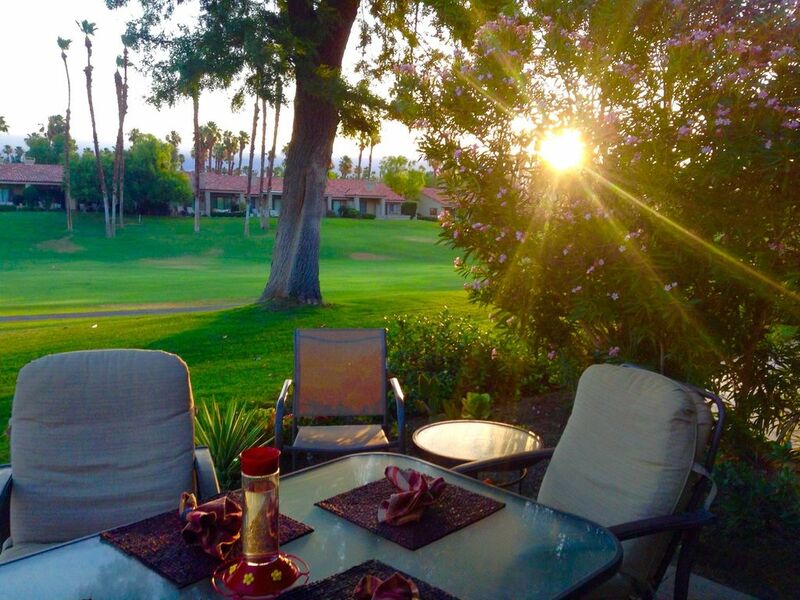 Backs onto the 18th fairway, swaying palm trees, and beautiful sunsets. 3 Bedrooms , 2 Baths, (Sleeps 6). Mountain and golf course views. Completely refreshed in August 2018! Achieve ultimate relaxation overlooking mountain views, swaying palm trees, and amazing sunsets. Pool, hot tub, and 100,000 sq. ft. clubhouse just steps away. Very spacious 1800 sq. ft., 3 bedroom condo with 2 full bathrooms, sleeps 6. Large master bedroom has 55" TV, private patio, and massive bathroom ensuite. Second bedroom has 45" TV and connects to 2nd bathroom. 3rd bedroom has pull out sofa and doubles as a bright and spacious office or TV room with additional flat screen TV. Spacious living room with vaulted ceilings, 60" TV, and gas fireplace. Along with the adjacent bright and beautiful dining room, wall to wall patio doors overlook the 18th fairway and fabulous mountain views. Patio with natural gas BBQ backs onto the 18th fairway of the Championship golf course, one of two on the property (golf is not included in your booking). Full size washer, dryer, and dishwasher recently replaced. All bedding, bath & beach towels, and kitchenware brand new in August 2018. California shutters throughout. Double car garage. Free WIFI, movie channels, blueray player. The 100,000 sq. ft. clubhouse offers restaurants, shops, and a swimming pool accessible for guests. Tennis, golf, and a fitness centre are also on site, but not accessible for guests. 5 minute drive to Ralph's grocery store, Starbucks, dry cleaners, Post Mail & Pharmacy, Cork Tree restaurant, Sherman's Deli, and much more. The views are amazing, from sunrise to sunset. The members here are super friendly, everyone says hello, and greets each other with a smile. Main bath has a soaker tub and shower. 2nd / guest bath has tub and shower. Turnkey with towels and amenities. Ei Paseo Drive in the heart of Palm Desert that is the "Rodeo Drive" of fashion, restaurants and music. Classic car shows on every 2nd Friday during the Spring. It is an executive style clubhouse but at the same time a friendly casual place. The best County Club atmosphere in all of the valley. Palm Desert & Palm Springs farmers markets, Sat., Sun. & Thursday evenings in Palm Springs. The back patio faces the center fairway of the 18th fairway on the Challenge course, one of two courses. There are several lakes through out the property on the 2 golf courses. It makes for a terrific sunset walk. From front and back of the condo. Big Bear and San Jacinto, amazing at sunset. Waterfall at Sales office that can be seen from back patio. Along with water lakes and fountains through out the club property. Land line with message voicemail. New August 2018! Several styles, Egyptian cotton to 500 count cotton. guest parking in driveway or short term on street after pass from Security. Double car garage with remote access. All types including several beach/pool towels. Available at clubhouse when guested in as renter at a small fee of $15. State of the art equipment. Swimming excersiseclasses at club house, yoga etc. Very large, tiled with Tommy Bahama leather couch & chair. Chenille recliner chair. Whirlpool Fridge with auto ice and water. Massive shelving and freezer storage. Automatic exterior moisture control. Frigidaire Speed bake oven with self cleaning feature. Frigidaire Gallery Series Microwave with turntable and one-touch cooking. Everything including BBQ utensils. Salsa chopper & Veggie Chopper. Ouster blender. Cuisinart coffeemaker with timer and strength settings. Settings for up to 12, all white. Any type of kitchen utensil you could imagine. Kitchenware all brand new in August 2018! Has all the essentials for your stay; plates, glasses, pots, pans, BBQ tools, coffeemaker. There are several different place mats and cloth napkins available. 3 flat screen TV from 60" to 45"
Spectrum with over 200 channels including movie channels. Pay per view movies available at an "after billing" to the renter. Yes with a CD player. Several variety in office / 3 rd bedroom. Along with several up to date Palm Springs Life issues. Air mattress for pool and an Electric Air Pump for a,y new ones. PS... Rite Aid, 1 1/2 mile away have amazing rafts and pool assesories. Kept beautiful by HOA a,d owner as E love flowers. Home based gas line Fire Grill. Tiled patio just adjacent to living room and dining room by BBQ grill, with two 12 ft sliders with Calilifornia Shutters. 2 amazing courses. Challenge and Champion 18 hole. Putting practice green and driving range. Clubs available at golf shop for rent. Also at the main clubhouse. Where the staff will happily assist. In the Spa Clubhouse available if guested in and $15 fee is mid. Several hot tubs through out with the area pools. There are several activities available if you are adventurous. The staff at the Clubhouse are outstanding, including Chef McKenzie and Cevoli. There are weekly specials including Monday Night Football, Tapas Tuesday and Pasta Friday, as well as special holiday dinners. Great hosts, super clean, and very relaxing! Everything was super easy from start to finish. Lorraine is a great host and owner, extremely helpful and responsive. The place is great - secure, quiet, and clean. Tons of space with everything you need. Great view from the patio of swaying palm trees, mountains, and the 18th hole water feature. The pool and hot tub are super close, right across the street. Big screen TV in every room and wifi. Definitely recommend! The place was very spacious and modern. The city of Palm Desert is beautiful with tons of things to enjoy. music and/or eat. There is "Small Plates" on Tuesdays & Pasta Night on Fridays along with Monday Night Football parties at the clubhouse. the pools have been changed to saltwater also. There is a $125.00 cleaning fee due at check out. Just leave the cash on the table in the entry way under the rectangle dish.